Rich are getting richer and while the opposite is true for the poor. 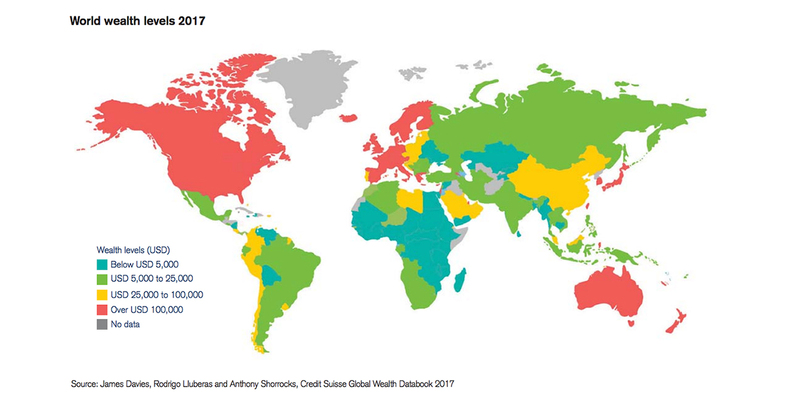 According to a Credit Suisse’s annual Global Wealth Report, top 1% now own more money than half of the world combined. The report comes out a week after Paradise Papers were released. The papers manifested how the rich individuals and corporations, like Apple and Nike, use offshore accounts and tax havens to avoid billions in taxes. Global financial crisis of 2008 shook the whole world, however, the rich still benefited from it as the difference between wealthy and middle class is now more than ever. China is the only country where the median wealth declined as the financial calamity took its toll. “While the bottom half of adults collectively own less than 1 percent of total wealth, the richest decile (top 10 percent of adults) owns 88 percent of global assets, and the top percentile alone accounts for half of total household wealth,” the report stated. According to the report, 3.5 billion adults only comprise 2.7% of the global wealth, these individuals have net worth below $10,000. On the other hand, the millionaires form 1% of world’s whole population but still own 46% of total household wealth. “In contrast…the 36 million millionaires comprise less than 1% of the adult population, but own 46% of household wealth,” the report claims. In 2000 top 1% owned 45.5% of all household world, the number is now 50.1% as the situation continues to grow. This increase in wealth on one side was mainly due to the increased number of Ultra High Net Worth Individuals (UHNWIs). Since 2000, the number of UHNWIs has increased five times. It fits broadly along with the things we really noticed this year — that is, the massive increase of wealth in just one unit,” Oxfam International is one the firms that helps people grow their assets. Lawson further explained that the wealth of one group has increased because of how they have avoided millions and billions in taxes. You’ve got a direct link between tax havens and this explosion in the wealth of the super-rich which we see in the report today. They’re using industrial levels of tax avoidance to make sure their fortunes are shielded from the tax man. They’d be less wealthy if they paid the tax they owe. This is clearly a crisis, and it is a crisis that is getting a lot worse. Though the rich in America benefited from 2008 crisis, the period after that saw a decrease in financial growth of Africa and Asia-Pacific. The United States continued its remarkable unbroken spell of gains after the financial crisis. The trend towards tangible worth like owning land and houses has decreased as people have focused more on bonds and stocks.